Found 3 guides for Hampta Pass trek. The Hampta Pass Trek takes you to the beautiful Chandra valley in Lahaul Spiti. On this trek you get to walk across green pastures and captivating forests. You get to see beautiful wild flowers of varying colours, snow clad mountains, rivers and streams. Optionally from Chatru, you could also plan a visit to Chandrataal, the moon lake. A sample generic itinerary starting and ending at Manali. Question: I am planning a trek at the end of June to Hampta Pass and Chandrataal. I wish to trek to Chandrataal from Kunzum pass, instead of driving down. Can you advise how to reach Kunzum Pass and the trail from Kunzum Pass to Chandrataal? Trek from Batal (or from a little ahead at the Chandrataal turn) to Chandrataal on a Jeep path. Trek from Kunzum La Pass to Chandrataal on a trail. Option 1: Trek on the Jeep path to Chandrataal. You should plan to take the Manali to Kaza bus from Chatru. The bus reaches Chatru at about 10am. So you should plan to reach Chatru by this time! If you miss this bus, you could probably try for a lift till Batal. If you get the bus, the bus would reach Batal by 12:30pm and you can ask the conductor to drop you off at the turn for Chandratal lake. Consider spending the night at Batal if you don't reach Batal by 1:30pm. From Batal, the road towards Kunzum Pass has a turn, a jeep path which goes to Chandrataal. It is about a kilometer or two from Batal. From the jeep path, it is a straight road to the Chandrataal camping area. It would take you around 3 to 4 hours to reach the camps. Option 2: Trek from Kunzum La Pass to Chandrataal on a trail. This is an adventurous and scenic trail. For this again, you should plan to take the Manali bus from Chatru to Kunzum La Pass. If you miss this bus, you could probably hope for a lift till Kunzum Pass. In any case, you should plan to start the trek from Kunzum Pass not later than 1pm. If you get delayed, you can spend the night at the one and only Dhaba at Batal. The Dhaba is called Chandra Dhaba and also lovingly called Chacha Chachi Ka Dhaba. The trail from Kuzum pass is not clear at places, so ensure you have some one experienced with you or you have researched the trail enough using Google Earth that you are confident. Carry a facemask because it is super dusty once you cross Gramphu. Question: What are the camping options in Chandrataal? You have four to five different agencies who provide camping options there. (Parasol,Samsong, Moon Lake,Jamaica,Chandrataal Camps). You can also put up your own tents on payment of fees to the agencies. Question: How far is Chandrataal lake from the camping area? From the camping area, the lake is about 60 to 90 minutes trek towards the north-east direction. You can start early around 7, reach by 8am go around the lake within 2 hours and come back to the campsite. Or you can choose to go at any time as the lake changes colors through the day. The benefit of going early is you avoid the cold, strong winds. During the mornings, there will not be much wind, but as the day passes by around noon you can expect strong winds. Question: What are the options to go back to Batal or Kaza from Chandrataal? From Chandrataal, you can get back to Batal by sharing a Bolero pick up truck for 300/- per head one way. You can check with the camping agencies there. If you are heading towards Manali, the bus from Kaza to Manali, reaches Batal after noon. If you are heading towards Kaza, you can catch the bus from Manali to Kaza which also arrives around noon. From Batal you can also take a shared cab @ 300/- per head to Kaza. You can also check for a direct drop to Kaza/Manali from Chandrataal, if its your day, you may get a direct drop. Question: Can we trek from Kunzum Pass to Chandrataal? Yes there is a trek route from Kunzum Pass to Chandrataal! Trekkers do get off the bus at Kumzum Pass and trek to Chandrataal. One of the important precautions to take is to plan to reach Chandrataal camp by 4pm, don't trek it alone. Question: Can I do the Hampta Pass trek in February or March? No it is not the recommended time to do this trek as Hampta Pass trek will have deep snow. Crossing over the pass is nearly impossible, and the roads from across the pass will also be closed due to snow. The best time to do the Hampta Pass trek will be mid june! Question: How many camp sites do we have on the Hampta Pass trek, at which trekkers camp for the night? There are 3 camp sites for halting for the night, Chikka/Jwara, Balu Ka Ghera and Shea Goru. You will find Siya Garu to the be coldest of them all! Question: Do I have to hire a guide as I am planning to do a solo Hampta Pass trek? Yes it is recommended to hire a local guide for this trek, because it is a multi day trek, you would have to carry your food, camping equipments et all. A local guide wil hire a cook, a helper, mules and a person to handle the mules. The mules will be loaded with the camping equipment and food. You could also load your own backpacks on the mules on extra payment. By hiring a local guide you will also be helping in their livelihood. Question: Is October 2nd week suitable time to do the Hampta Pass trek? Mostly yes Hampta Pass trek can be done in the month of October. The local guides are the best judge of the weather as weather conditions change very abruptly on the mountains. Question: I am planning my first trek and I am thinking of Hampta Pass. Is it advisable to start my first Himalayan trek with Hampta Pass? If you have been a regular low land trekker, then you can surely do the Hampta Pass trek with no problems at all. On the other hand if you have not trekked earlier but you are physically active and fit, then also Hampta Pass trek is a good first option! Question: I am going for Hampta Pass trek soon and need to buy a trek bag. Can you suggest me which backpack to purchase ? You can go for backpack which is between 50L to 60L. For Hampta Pass a 50L would be sufficient, but if you get more adventurous in the future, the extra space will come handy. Wildcraft and Quecha have some good options. Question: Anyone who has completed Hampta Pass Trek solo? Would like to know whether it is safe to do this solo? Hmmmm, If you have done this solo and reading this, make a comment below so we can answer this question! Question: I am confused between Kashmir Great Lakes trek and the Hampta pass trek? Which one should I go to? The Kashmir Great Lakes trek is a more beautiful trek. It is one of the most beautiful treks in India. The choice also comes down to the location you want to trek in. Hampta Pass trek starts from Manali which is a beautiful and peaceful town in Himachal and very tourist friendly, whereas Kashmir Great Lakes is in Kashmir, one of the most beautiful places but has seen a lot unrest. Question: I am confused between the Hampta Pass trek and the Valley of flowers trek, which one should I go to? The Valley of flowers is a beautiful trek and you can see a lot of flowers on this trek. Valley of flowers should be done latest by August first week if you want to see lots of flowers. The Hampta pass trek has got its own valley of flowers too, between Chika and Balu ka Gera. It may not be comparable to the Valley of flowers trek, but overall Hampta Pass would be a more beautiful trek with its mountains, meadows, flowers, snow and ending in the rocky and sandy, brown mountain, Spiti Valley. It provides more scenery changes and beauty to a trekker. So Hampta Pass is a better option. Question: Can I do the Hampta Pass trek in Winter? No. Hampta Pass trek cannot be done in winter because of the deep snow which covers the pass. As also road connectivity from Spiti Valley is closed due to heavy snow. Instead, you could do the Kedarkantha trek or the Kuari Pass trek in Winter. Question: Does it rain in Hampta Pass in August? There is a proabablity of rain in Hampta Pass in August. 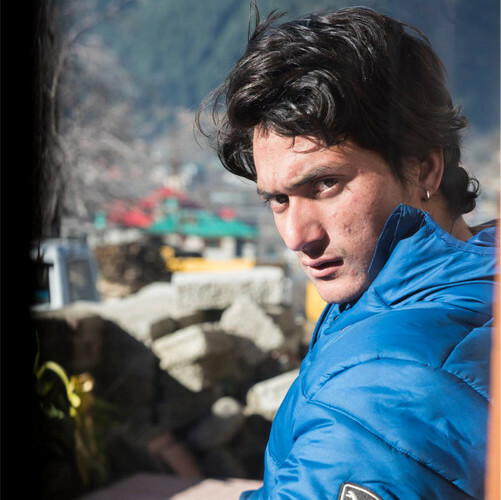 Question: Can hampta pass trek be done in 3 nights and 4 days? The answer to this question depends on who is asking, a local guide will be able to cover the distance even faster. An experienced trekker could probably do it. When trekkers refer to the Hampta Pass trek, they implicitly also tend to include the drive to Chandrataal and back. Only the Hampta pass trek would mean cross over the Hampta Pass to Chattru. Questions: Is it safe to do Hampta pass trek in a group of three with almost no pior trekking experience without a guide? Absolutely no! Because you DONT HAVE ANY trekking experience in the Himalayas. Get a little experience first so you can understand the risks on the mountains. Things may go absolutely fine without a hitch, but if things start to go wrong you would not know how to deal with it. On the mountains it is always about understanding the level of risk relative to your mental and physical capacity. The point is simple that since you have no trekking experience you cannot make a realistic judgement of the risks. Hampta pass is a moderate level trek, what is unpredictable is the weather or if you lose your way or you inadvertently do something foolish. Get a guide along and he will charge you on a per day basis and you pay for his food too, hardly any money compared to what could be lost if things go wrong. It will also give a good first experience of the Himalayas for you to venture by yourself in the future. I can't stress on this point enough as a lot of things can go wrong on the mountains. Question: Would the Quechua Arpenaz 100 hiking shoes be suitable for Hampta pass trek? If you like the Hampta Pass trek and plan to do more treks in the future, it may be worthwhile to purchase the Quechua Forclaz 100 shoes for the Hampta Pass trek. The 2016 - Forclaz 100 is the remodelled version of the Forclaz 500. Investing in the Quechua Forclaz 100 is worthwhile and if your budget is slightly extensible you could go for the Quechua Forclaz 500.